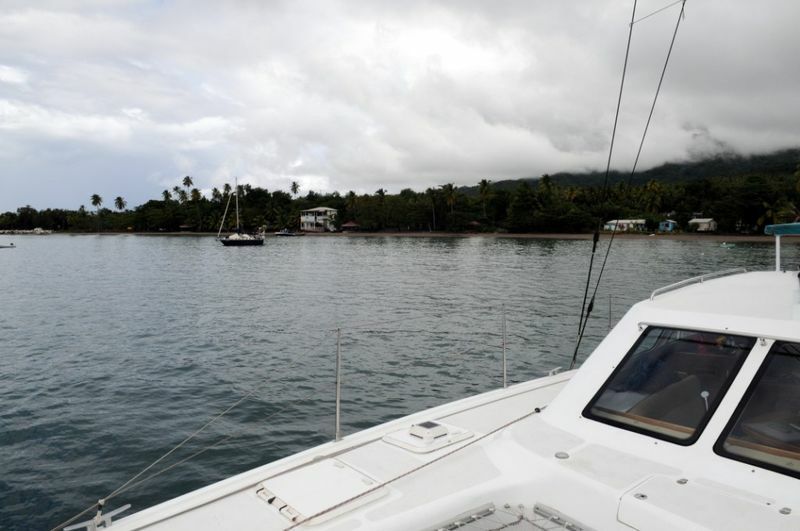 I’m currently anchored in Prince Rupert Bay in Dominica. I would go ashore and explore the rainforest if it wasn’t for the fact that it’s pouring down. I know it’s a bit ironic, but I’m not talking about some light drizzle, it is bucketing down outside. So instead I’m catching up on my emails on the boat having forked out $10 to get connected to the HotHotHot network. All is good. I arrived here in the afternoon yesterday from St. Pierre on the North tip of Martinique after my first proper open-ocean solo sail with this boat. The sail was a bit of a disaster, I set sail with a very conservative reefed main and double reefed genoa only to be met by big waves and wind that was bordering too strong. I had to turn my rudder all the way to port to counter the wind, so I knew I was over-canvassed (though according to the manual that came with the boat I was not). I pulled in the genoa and put the bows into the wind and waves. The autopilot gave me grief, so I had to turn it off and had to dash down to steer manually every 15 seconds. The waves were pretty big and for the first time in my life on this boat I was actually afraid. The mainsail ripped as I was lowering it, hugely frustrating, since this was the first time I was using it since I got it repaired in Le Marin. After a lot of cursing, sweating, getting drenched by sea-water and holding on for dear life I managed to secure the sail and turn towards my course. 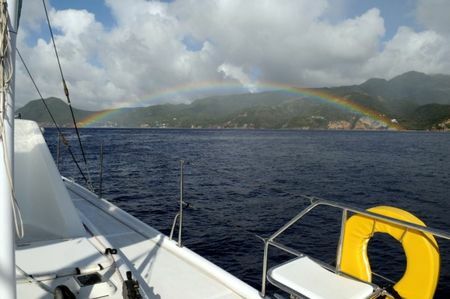 Needless to say I was depressed about the sail, but I chose to focus on good things: The genoa still works and the autopilot decided to work again, so I was back in business, motorsailing doing between 5 – 7 knots. The waves were really big and by far the biggest I’ve ever sailed in. I tried to take pictures, but they look puny on film, so you’ll have to take my word for it. I got drenched sitting in the cockpit, so that says something to the people that have been onboard. Once I got to the lee side of Dominica the waves vanished, but the wind didn’t, so I continued in a much more leisurely fashion. While making my way I spotted a whale waving its tail towards me and also a marlin raced out of the water in hot pursuit of some prey. Added to this, I saw some stunning rainbows, so though the sail started bad, the ending was nice. As I was making my way into Prince Rupert Bay I passed Wind Surf, one of the old Windstar cruise ships. I was planning to sail for Antigua at 2pm, allowing 16 hours to cover the 95nm to Antigua, but I’ve decided to hit the sack early and get up at 3am and set sail then instead. 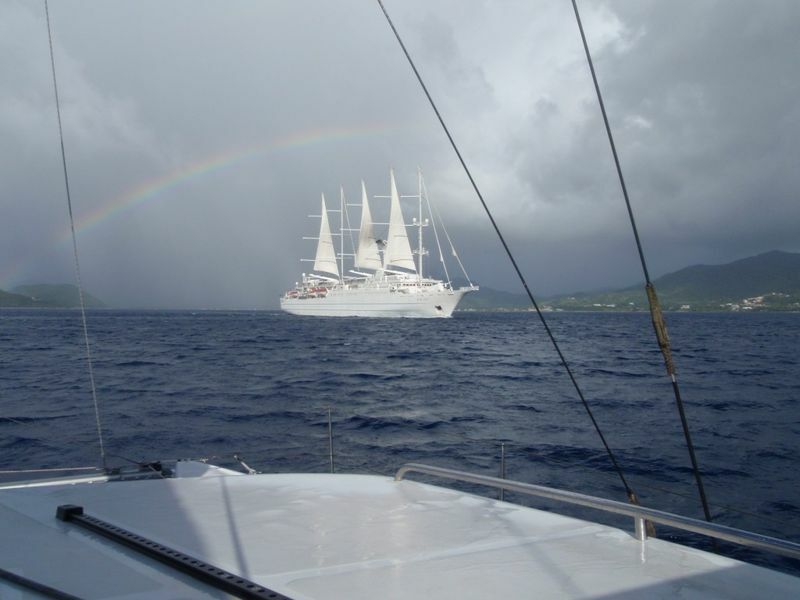 The wind will be more favorable and it will be nice to get to Antigua just before it gets dark, so that I can enjoy a good night’s sleep without having to do a proper night-sail.